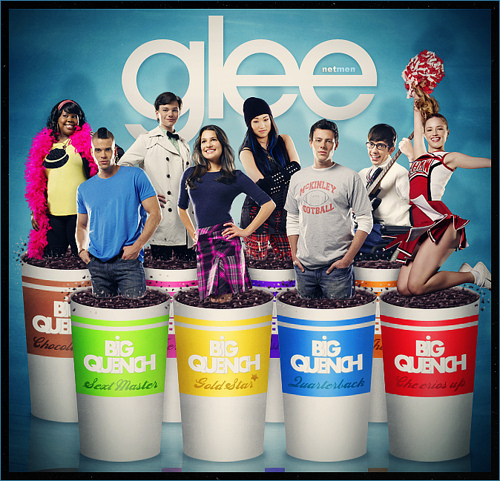 TV Show Review: “Glee” – Fall Season Premiere! If you haven’t seen Glee and all of its magnificence, I suggest you go now and rent the previous seasons or at least try keeping up with the new season. I’M SO EXCITED GLEE IS BACK TO MY TUESDAY NIGHTS! And I know all of my Gleeks out there are happy for this too! Back to school everyone! It starts with the nerdy kid with the afro (what’s his name again?) filming all of the kids from Glee asking them questions about their summer for his blog in which apparently people bash the Glee Club. Then, we’re introduced to the new female football coach, (you heard right), and like Sue Sylvester said ” a female football coach is like a male nurse, a sin against nature” LOL. Anyways, her name is Coach Beiste (pronounced like Beast kinda, really fitting huh?) and apparently the school is cutting the budgets of all of the extracurricular activities yet again, and now the principal thinks that the best option is to take part of the Cheerios funding and 10% of Glee Club’s funding to help out strengthen the football team that now Bieste is coaching. Will Schuester and Sue Sylvester are obviously upset about this, and decide to team up to bring Bieste down. He has the Bieber haircut, he has really big lips (Thank you Puck for confirming this) and he has an amazing voice and auditions with the song “Billionaire” by Travie McCoy and Bruno Mars. SUNSHINE CORAZON! THE NEW FILIPINO GIRL THAT CAN PERFORM DREAMGIRLS MUSIC! We meet the filipino Sunshine Corazon (Charice) when she performs “Telephone” by Lady Gaga with the one and only Rachel Berry, after they are abruptably stopped in the school’s restroom by an annoyed Sue Sylvester. (Epic moment to disrupt the song! hahaha). Sunshine said she will try out for Glee club and Rachel feels threatened by her. Therefore, she does stuff to trick Sunshine and make her not show up at the tryouts afterschool. By the way, her performance of “Listen” was hands down AWESOME! – Tina and Mike Chang (ASIAN SENSATION COUPLE) are dating after going to Asian Camp together over the summer. – This means Artie is devastated and wants to get Tina back. And the only way to do that is if he joins the football team and gets some…abs. Yeah, abs. And I would just like to take the time to say…. I CANNOT WAIT FOR MISS BRITNEY SPEARS TO BE ON THE NEXT EPISODE! Just the preview gave me goosebumps. Like you really had no idea how much I’ve been waiting for this episode. Am I doing a review about it? OF COURSE! Previous ArticleFilm Review: "Never Let Me Go"